We described a generalized suppression of CTL anamnestic responses that occurred in mice bearing large tumor nodules or immunized with powerful recombinant viral immunogens. Immune suppression entirely depended on GM-CSF-driven accumulation of CD11b+/Gr-1+ myeloid suppressor cells (MSC) in secondary lymphoid organs. To further investigate the nature and properties of MSC, we immortalized CD11b+/Gr-1+ cells isolated from the spleens of immunosuppressed mice, using a retrovirus encoding the v-myc and v-raf oncogenes. Immortalized cells expressed monocyte/macrophage markers (CD11b, F4/80, CD86, CD11c), but they differed from previously characterized macrophage lines in their capacities to inhibit T lymphocyte activation. Two MSC lines, MSC-1 and MSC-2, were selected based upon their abilities to inhibit Ag-specific proliferative and functional CTL responses. MSC-1 line was constitutively inhibitory, while suppressive functions of MSC-2 line were stimulated by exposure to the cytokine IL-4. Both MSC lines triggered the apoptotic cascade in Ag-activated T lymphocytes by a mechanism requiring cell-cell contact. Some well-known membrane molecules involved in the activation of apoptotic pathways (e.g., TNF-related apoptosis-inducing ligand, Fas ligand, TNF-α) were ruled out as candidate effectors for the suppression mechanism. The immortalized myeloid lines represent a novel, useful tool to shed light on the molecules involved in the differentiation of myeloid-related suppressors as well as in the inhibitory pathway they use to control T lymphocyte activation. Apoptotic death of CD8+ T cells can be triggered by a population of myeloid suppressor cells (MSC)3 that are positive for the CD11b and Gr-1 markers expressed by immature myeloid precursors (1, 2, 3). These cells are responsible for the immunosuppression observed in pathologies as dissimilar as tumor growth, treatment with cyclophosphamide, and overwhelming infections (2, 4, 5). Also nonpathological situations such as immunization with powerful recombinant vaccines can associate with a transient immunosuppression due to MSC activity (1). The appearance of a CD11b+/Gr-1+ population of inhibitory myeloid cells could be attributed to high levels of GM-CSF released in vivo (2, 3, 6). Depletion of MSC in vitro or in vivo was shown to be sufficient to reverse the depression of CD8+ T cell function, thus confirming MSC remarkable role in induction and maintenance of the host immunosuppression (1, 2). The myeloid suppressor cells have been defined in the past as natural suppressors, and constitute a cell population with an uncertain phenotype (7). Even though several data suggested that they belonged to the monocyte-macrophage lineage, discrepancies in the marker distribution among the suppressor cells have been reported (6, 8, 9, 10). We found that MSC isolated from the spleens of immunocompromised mice were positive for CD31 Ag, a marker of granulocyte/monocyte mouse precursors. These CD11b+/Gr-1+/CD31+ splenocytes retained their inhibitory properties when cultured in vitro in standard medium, but suppressive functions could be modulated by cytokine exposure (3). Exposure to IL-4 increased MSC-inhibitory activity, while culture in the presence of IL-4 and GM-CSF induced their differentiation into a nonadherent population of dendritic cells (DC). Exposure to type I Th cytokines, such as IL-12 or the combination TNF-α and IFN-γ, also abrogated the suppressive activity by inducing differentiation into macrophage-like cells able to sustain T lymphocyte activation. A common CD31+/CD11b+/Gr-1+ myeloid progenitor can thus be isolated from the lymphoid organs of immune compromised mice that gives rise to accessory cells capable of either activating or inhibiting the function of CD8+ T lymphocytes, depending on the cytokines present during the progenitor maturation/differentiation process (3). To investigate the molecular mechanisms governing the MSC differentiation and suppressive properties, we immortalized CD11b+/Gr-1+ cells selected by panning from the splenocytes of immunosuppressed mice. Immortalization was conducted by repeated cycles of infection with an ecotropic retrovirus encoding the oncogenes v-myc and v-raf. The immortalized cell lines shared many of the monocyte/macrophage markers (CD11b, F4/80, CD14, CD11c), but differed from previously characterized macrophage lines for their ability to suppress lymphocyte proliferation and cytotoxic response induced by alloantigens. Following an initial screening of the various immortalized cell lines, we finally selected two stable MSC lines: MSC-1 and MSC-2. The first line retained its inhibitory properties, while the second strongly up-regulated its suppressive functions after exposure to the cytokine IL-4. MSC-1 and IL-4-pretreated MSC-2, but not untreated MSC-2, were also able to suppress the function of Ag-specific CTL clones by triggering their apoptotic cascade. CT-26, a BALB/c (H-2d) carcinogen-induced, undifferentiated colon carcinoma, and MBL-2 (H-2b), a Moloney virus-induced lymphoma, were previously described (2, 3). The mouse mammary adenocarcinoma, TS/A (H-2d), was kindly provided by Dr. G. Forni (University of Turin, Turin, Italy). NIH J2 Leuk is a monocyte/macrophage cell line immortalized from bone marrow of C3H/HeJ mice (11, 12). L1210 (H-2d) lymphocytic leukemia, J774A.1 macrophage, and NIH-3T3 fibroblast cell lines were purchased from the American Type Culture Collection (ATCC, Manassas, VA). E88 CTL clone and the adenocarcinoma C26 (H-2d) were kindly provided by Dr. M. Rodolfo (Istituto Nazionale Tumori, Milan, Italy). Cells were maintained in medium 1 consisting of DMEM (Life Technologies, Paisley, U.K.) supplemented with 2 mM l-glutamine, 10 mM HEPES, 20 μM 2-ME, 150 U/ml streptomycin, 200 U/ml penicillin, and 10% heat-inactivated FBS (Life Technologies). A panning technique was used to enrich Gr-1+ cells from the spleens of immunosuppressed BALB/c mice. Briefly, 60-mm petri dishes (Falcon 1016, Cockeysville, MD) were coated for 3 h with 10 μg/ml of the anti-Ly-6G mAb, RB6-8C5 (ATCC; purified from ascites), washed, and blocked with 10 mg/ml BSA in PBS. Splenocytes (3 ml, 2.5 × 107 cells) were dispensed into petri dishes and after 1 h at 37°C, the dishes were washed and medium 1 was added to the attached cells. Cells were incubated for an additional 6 h and detached by gentle pipetting with PBS plus 2 mM EDTA. Gr-1+ splenocytes were infected with a retrovirus encoding the viral oncogenes v-myc and v-raf using 50% supernatant from NIH J2 Leuk cells (11, 12). After 24 h, cells were collected and exposed to a second round of infection under the same conditions. Cells were then resuspended in medium 2 consisting of RPMI 1640 (Euroclone, Paignton-Devon, U.K.), 10% heat-inactivated FBS (BioWhittaker, Walkersville, MD), 2 mM l-glutamine, 1 mM sodium pyruvate, 20 μM 2-ME, 150 U/ml streptomycin, and 200 U/ml penicillin. For the first 3 wk, 10 ng/ml mouse GM-CSF (PeproTech, Rocky Hill, NJ) was added to the culture together with 25% conditioned medium from NIH-3T3, then replaced by 25% conditioned medium from the same immortalized cells. After 1 mo, cells were grown in medium 2 without GM-CSF and conditioned medium. The MSC-1 line originated from Gr-1+ splenocytes from mice bearing a 1-mo-old TS/A tumor, while the MSC-2 line originated from Gr-1+ splenocytes from mice immunized 6 days earlier with a recombinant vaccinia virus encoding mouse IL-2 (1). Cell lines were subcloned by limiting dilution using GM-CSF and conditioned medium as supplements to medium 2 during the first stages. The cell lines have been frozen, thawed, and grown in medium for more than 1 year, with no sign of stable changes in their phenotype and function, although fluctuation in some marker expression levels has been occasionally detected. The uncloned lines, and one clone each from MSC-1 and 2 were used throughout these studies. Data obtained with the subclones were identical with those obtained with the parental lines. SPSYVYHQF, representing the aa 423–431 of the gp70 envelope protein of the endogenous AKR623 retrovirus presented in association with H-2 Ld (13), was synthesized and purified by Neosystem (Strasburg, France). Mouse rGM-CSF, and IL-4 (PeproTech) were resuspended in PBS containing 1% mouse serum (Sigma, St. Louis, MO). Human rIL-2 (Euro Cetus-Chiron, Milan, Italy) was resuspended in RPMI with 20% FBS. MLC were set up in 24-well plates by coincubating in a total volume of 1 ml/well 2.5 × 106 splenocytes from 8- to 12-wk-old female BALB/c mice (H-2d), an equal number of γ-irradiated C57BL/6 splenocytes (H-2b), and (unless otherwise stated) 3% (of the total number of cells) γ-irradiated MSC or J774A.1 control cells. In cell separation experiments, splenocytes were cultured at the same cell concentration as above in 24-well plates (Falcon) containing a culture chamber insert with 0.45-μm pores (Millipore, Bedford, MA). Alternatively, 105 E88 CTL were stimulated with 0.75 × 105 C26 and 3 × 106 BALB/c splenocytes, both γ irradiated, in a final volume of 1 ml/well of medium 2 containing 10 U/ml rIL-2 and 0.15 × 106 γ-irradiated MSC or J774A.1 cells. After 5 days, the cultures were tested for the ability to lyse peptide-pulsed or allogeneic targets in a 5-h 51Cr release assay using 2 × 104 target cells previously labeled with 100 μCi Na51CrO4 for 60 min. The percentages of specific lysis were calculated from triplicate samples using the formula: (experimental cpm − spontaneous cpm)/(maximal cpm − spontaneous cpm) × 100. LU per 106 effector cells were calculated by dividing 106 by the number of cells giving 30% specific lysis. LU/106 cells were then used to calculate the LU/culture from the number of viable cells recovered in the cultures. BALB/c splenocytes (2 × 105 cells/well) were cultured in 96-well round-bottom plates (Falcon) and stimulated with an equal number of γ-irradiated C57BL/6 splenocytes. Various numbers of γ-irradiated MSC or J774A.1 cells were added in a total volume of 200 μl/well of medium 2. After 3 or 5 days of incubation, cultures were pulsed with 1 μCi/well [3H]TdR (NEN, Life Science Products, Boston, MA), and [3H]TdR incorporation was measured by scintillation counting. Data are expressed as cpm (mean ± SD) of triplicate cultures. FITC- or PE-labeled mAb recognizing mouse CD11b (Mac-1), CD14, Mac-2, Mac-3, H-2Kd, H-2Dd, CD80 (B7-1), CD30, CD40, I-Ad/I-Ed, CD3, CD4, CD8, and isotype-matched controls were purchased from PharMingen (San Diego, CA); FITC- or PE-labeled mAbs recognizing mouse Ly-6G (Gr-1), or CD86 (B7-2), were from Immunokontact (Bioggio, Switzerland); rat mAbs recognizing mouse F4/80, MOMA-2, 88a, CD31, ER-MP58, DEC-205 were from BMA Biomedicals (Augst, Switzerland). PE donkey anti-rat F(ab′)2 (Jackson ImmunoResearch, West Grove, PA) or TC streptavidin (DakoPatts, Glostrup, Denmark) were used for secondary labeling. Biotinylated rat anti-mouse CD11c mAb (N418; ATCC) was a gift of U. Grohmann (University of Perugia, Perugia, Italy). The mAb 2.4G2 (anti-mouse CD16/CD32; PharMingen) was used to block binding to FcγR. Cells were treated with 2.4G2, stained with appropriate amounts of mAb (1–10 μl/106 cells), and analyzed using a Coulter XL flow cytometer (Coulter Electronics, Hialeah, FL) equipped with a 488-nm Argon Ion Laser (Coherent, Innova). At least 10,000 cells were collected for each histogram, and dead cells were gated out based on their scatter properties. FITC-conjugated annexin-V (Boehringer Mannheim, Indianapolis, IN) was used to detect apoptosis. Briefly, 106 cells were stained with a PE-conjugated anti-CD8 mAb (PharMingen) and with FITC-conjugated annexin-V in 100 μl of labeling solution and incubated for 10–15 min, according to manufacturer’s protocol. Then 0.4 ml of incubation buffer (10 mM HEPES/NaOH, pH 7.4, 140 mM NaCl, 5 mM CaCl2) was added, and stained cells (15,000 or more) were analyzed by flow cytometry. The Multiprobe RNase Protection Assay (PharMingen) was performed according to the manufacturer’s directions with few modifications. Hybridization. [33P]UTP (70–80 μCi/reaction) was used to synthesize the probe, and 1.5 × 106 cpm was added to each hybridization reaction. After synthesis and addition of yeast tRNA and EDTA (final volume 50 μl), 25-μl aliquots of the reaction were placed on two TE Micro Select D G25 spin columns (5′-3′; Boulder, CO) and the probe purified by centrifugation for 30 s at 12,000 rpm in a microcentrifuge. RNase inactivation. A cocktail was prepared containing 200 μl Ambion RNase inactivation reagent (Ambion, Austin, TX), 50 μl ethanol, 5 μg yeast tRNA, and 1 μl Ambion GycoBlue coprecipitate per RNA sample. A total of 250 μl of the inactivation cocktail was pipetted into 1.5-ml microcentrifuge tubes, and the individual RNase-treated samples were added to each tube. The samples were mixed well, placed at −70°C for 30 min, and centrifuged for 15 min in a room temperature microcentrifuge at 14,000 rpm. The supernatants were poured off, a sterile cotton swap was used to remove excess liquid from the tube, and the pellet was resuspended in 3 μl of PharMingen sample buffer before gel electrophoresis. To obtain large, homogeneous populations of MSC, Gr-1+ cells were isolated from the spleens of immunosuppressed mice and immortalized by retroviral transduction. We infected this population containing the myeloid suppressors with an ecotropic retrovirus expressing myc and raf oncogenes that was used in previous studies to immortalize successfully mouse macrophages and DC (11, 12). After screening for the ability to suppress proliferative and cytotoxic responses, two cell lines, MSC-1 and MSC-2, were selected for further study. The phenotypes of these lines indicate that they, like the J774A.1 nonsuppressive control line, belong to the monocyte/macrophage lineage (Table I⇓). Moreover, although the MSC lines were derived from cells expressing Gr-1, a marker for immature myeloid progenitors and mature polymorphonuclear cells, they lost this marker during the immortalization process, as did Gr-1+/CD11b+ splenocytes when put into culture (1, 2). None of the cell lines examined expressed the CD3, CD4, or CD8 T cell markers, and class II MHC expression was low in all three lines, but could be strongly up-regulated by IFN-γ (data not shown). The MSC-1 and 2 lines showed significant differences in several markers; most notably MSC-1 showed decreased CD14 and MAC-3 expression, and increased DEC-205 when compared with MSC-2 and J774 cells. These differences did not reflect the distinct origins of the two lines because clones with the same phenotypes as MSC-1 and MSC-2 were isolated from both sources of myeloid cells (not shown). We suppose that these differences rather reflect the arrest at particular stages of myeloid differentiation stochastically achieved through the immortalization process. The immunosuppressive properties of the MSC lines were evaluated by adding them to MLCs. As seen in Fig. 1⇓, alloreactive CTL recognizing H-2b target cells were generated in a standard MLC, and in MLC in which J774A.1 cells were present. By contrast, addition of only 3% MSC-1 resulted in a complete abrogation of cytolytic activity of the MLC. Although MSC-2 were not constitutively suppressive in this assay, they acquired the ability to abrogate the cytolytic activity of alloreactive CTL following 2 days pretreatment with mouse IL-4 (Fig. 1⇓), and they retained their suppressive function for at least 7 days after removal of IL-4 (data not shown). Pretreatment of J774A.1 cells with IL-4 failed to induce the suppressive phenotype (not shown), implying that the MSC represent a specialized macrophage subset. Indeed, MSC-2, but not J774A.1 cells expressed the α-chain of the IL-4R (IL-4Rα), while the common γ-chain was present in both lines; MSC-2 also constitutively expressed the IL-7Rα (Fig. 2⇓A). The MSC-2 line underwent phenotypic changes following exposure to IL-4, the most important of which are summarized in Fig. 2⇓B. IL-4 up-regulated some costimulatory molecules such as CD80, and CD40; this together with the basal expression of CD86 (not shown) questions the loss of costimulation as the main mechanism for T lymphocyte suppression. Interestingly, an increase in CD4 expression was also observed in response to IL-4, but there was only a modest augmentation in I-Ad/I-Ed, although the same treatment causes MHC II up-regulation in mature mouse monocytes (14). 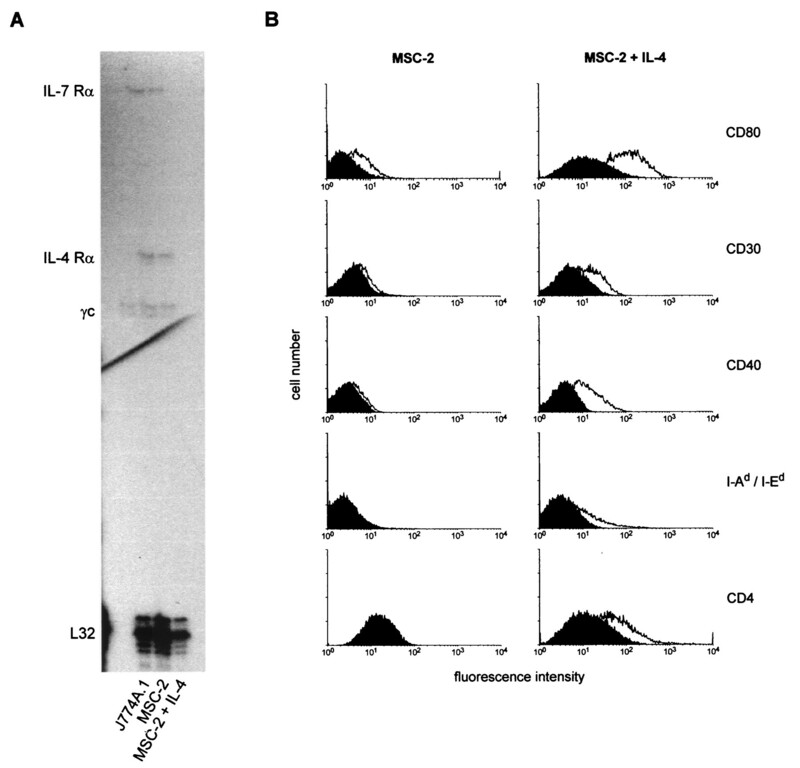 Inhibition of CD8+ lymphocyte function by MSC lines: MSC-1 is constitutively inhibitory, while MSC-2 exhibits suppressive functions following exposure to IL-4. MSC-2 were cultured in medium with or without 100 ng/ml of IL-4 for 4 days. MSC and J774A.1 macrophages were γ irradiated and added at a final concentration of 0.15 × 106 cells (3%) to a MLC consisting of 2.5 × 106 BALB/c splenocytes and 2.5 × 106 γ-irradiated C57BL/6 splenocytes. Membrane separation was performed to evaluate inhibition by soluble factor (boxed panel). 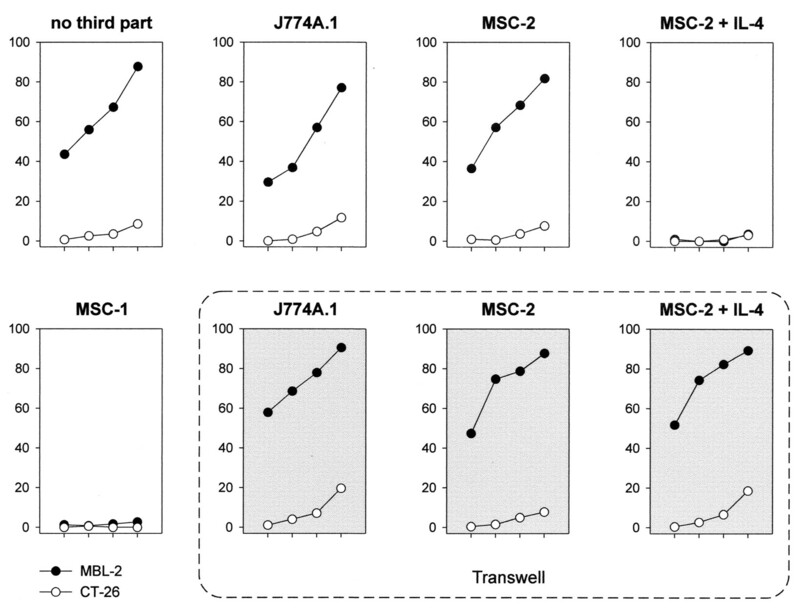 J774A.1, MSC-2, and IL-4-pretreated MSC-2 were γ irradiated, washed, and then incubated with spleen cells in a well separated by a semipermeable membrane (boxed panels). After 5 days, cytolytic activity in the cultures was tested, in a 5-h 51Cr release assay, against either a syngeneic (H-2d) target, CT-26, or an allogeneic (H-2b) target, MBL-2, at E:T ratios starting at 100:1, followed by 3-fold dilution (100/1, 33/1, 11/1, 3/1). Data reported in this figure are from a single experiment representative of 18 (n = 3, for the transwell analysis). IL-4 regulates the expression of surface Ags on MSC-2. MSC-2 were cultured in the absence or presence of 100 ng/ml IL-4 for 2 (A) or 4 (B) days. A, MSC-2, but not J774A.1 cells express both IL-7R and IL-4R. Evaluation of cytokine receptors was performed by RNase protection assay. A quantity amounting to 5 μg of total cellular RNA was hybridized to the PharMingen mCR-1 riboprobe for 20 h at 56°C, as described in Materials and Methods. Following gel electrophoresis, the gel was exposed to Kodak (Rochester, NY) Biomax MS x-ray film for 96 h at −70°C. L32 represents a control ribosomal gene. Lane 1, J774A.1 RNA; lane 2, MSC-2 RNA; lane 3, MSC-2 RNA following treatment with IL-4. B, Expression of surface Ags is modulated when MSC-2 are exposed to IL-4. Cells either treated or untreated with IL-4 were collected with PBS 2 mM EDTA, blocked for nonspecific staining with unlabeled anti-FcγR mAb, and then stained with different mAbs. Isotype-matched mAb were used as control for background staining (shaded areas). Data shown in the figure are representative of five independent experiments. To evaluate the involvement of soluble factors in MSC-dependent suppression, we set up transwell experiments in which MSC lines were cultured either together with, or in close proximity to, an allogeneic MLC. The effectors were then tested in a cytotoxicity assay against syngeneic (CT-26) or allogeneic (MBL-2) targets. As shown in the box in Fig. 1⇑, no inhibition of the MLC was observed when the IL-4-treated MSC-2 line was separated by the transwell membrane. Cell-cell contact was thus required for the suppressive activity of MSC-2 line. Suppression of CTL activity could occur at either the generation or effector phases. To determine whether MSC blocked proliferation, BALB/c splenocytes were stimulated with allogeneic cells in the presence of J774A.1 or MSC-2. When tested on day 3, MSC-2, but not J774A.1 cells inhibited the proliferation of alloreactive T lymphocytes, and this effect was not dependent upon previous exposure to IL-4 (Fig. 3⇓A). 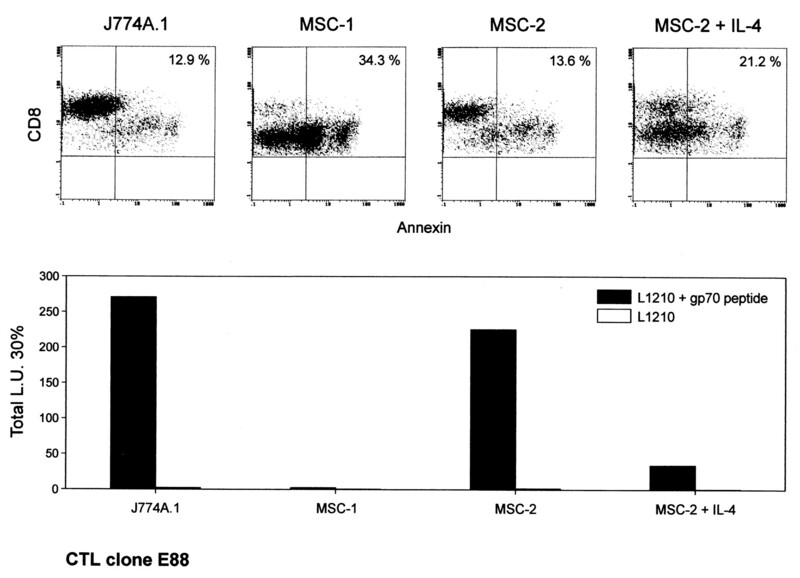 On day 5, IL-4-treated MSC-2 almost completely abrogated the MLC proliferation (Fig. 3⇓B), whereas J774A.1 and untreated MSC-2 partially blocked proliferation. However, this inhibition of T lymphocyte growth was not sufficient to impair the generation of a cytolytic response against allogeneic targets, as shown in Fig. 1⇑. MSC-1 also completely suppressed alloreactive T cell proliferation (Fig. 4⇓). 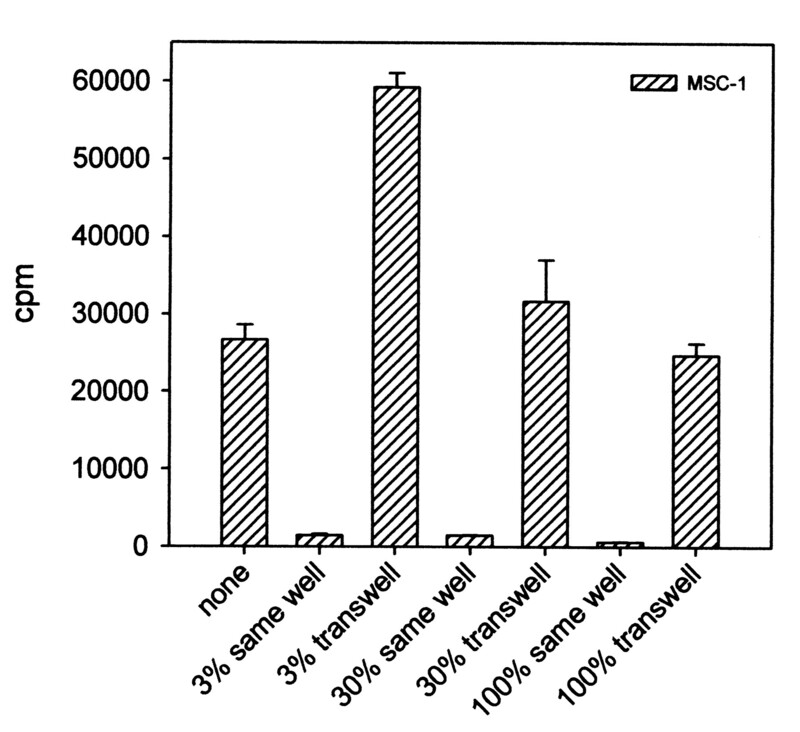 Like the MSC-2-induced suppression, this effect required cell-cell contact because the suppression was not observed when the MSC-1 were separated from the MLC by transwells. Increasing the number of MSC-1 to a 1:1 ratio with the effector cells in the MLC did not result in suppression across the transwell membrane, thus making less likely the involvement of soluble suppressive factors either released at low doses or unstable in the culture medium. MSC-2 line pretreated with IL-4 causes a long-lasting suppression of alloreactive T lymphocyte proliferation. J774A.1, MSC-2, and MSC-2 cultured in the presence of 100 ng/ml IL-4 for 4 days were γ irradiated, and then added at a final concentration of 3% to a MLC consisting of BALB/c splenocytes and γ-irradiated C57BL/6 splenocytes. After 3 and 5 days of culture, cells were pulsed with [3H]thymidine and harvested 18 h later. Data are from triplicate wells ± SD. The experiment was repeated three times with identical results. Suppression of alloreactive T lymphocyte proliferation by MSC requires cell-cell contact and not a soluble factor. MSC-1 were γ irradiated and cultured in various numbers (3% to 100% of total responders) with BALB/c splenocytes stimulated with γ-irradiated C57BL/6 splenocytes either in direct contact, or separated by permeable membrane (transwell). [3H]TdR was added after 3 days of cultures. Results are reported as mean of triplicate wells and were confirmed by two other independently performed experiments. We next evaluated whether the proliferative arrest was associated with cell death. Because only a small subset of cells proliferate in an MLC, we moved to a clonal lymphocyte population with a known Ag specificity. CTL clone E88 recognizing a Ld-restricted peptide of an endogenous retrovirus (15) was stimulated in vitro with peptide-pulsed syngeneic cells in the presence of either MSC or J774A.1 cells. Split cultures were analyzed for apoptosis on day 4 and cytolytic activity on day 5 (Fig. 5⇓). Apoptosis was detected as the percentage of CD8+ lymphocytes staining with FITC annexin-V, a protein with high affinity for phosphatidylserine, which is translocated from the inner to the outer leaflet of the plasma membrane in the initial phases of apoptosis (16). Compared with J774A.1, apoptosis was clearly increased when CTL were activated in the presence of MSC-1 and IL-4-pretreated MSC-2 lines. This cell death correlated with the drastic reduction in the number of LU recovered in the cultures of CTL E88. Interestingly, a high proportion of apoptotic (annexin-V+) CTL had decreased expression of CD8. Inhibition of Ag-specific lymphocyte response and induction of apoptotic death by MSC lines. E88 CTL clone was stimulated with γ-irradiated C26 tumor cells as source of Ag and BALB/c splenocytes as source of APCs, in the presence of 10 U/ml of rIL-2. Various numbers of γ-irradiated MSC were added as a third part. On day 4 of culture, lymphocytes were separated from necrotic debris by Ficoll, and 106 cells were stained with PE-conjugated anti-CD8 mAb and with FITC-conjugated annexin-V. Figures indicate the percentage of apoptotic cells among CD8+ lymphocytes. The experiment was repeated three more times with similar results. After 5 days, cytolytic response in the culture was assayed against the following syngeneic (H-2d) targets: L1210 pulsed or not with H-2 Ld-restricted gp70 peptide. LU 30%, defined as the number of lymphocytes necessary to achieve 30% specific lysis of 2 × 103 target cells in a 5-h assay, were calculated for the total, viable cells recovered from the cultures. It has been shown that both TNF-α and Fas-L are required to induce apoptosis of CD8+ T cells, whereas Fas-L alone induces apoptosis of most activated CD4+ T cells (17). These death signals engage specific receptors that assemble caspase-triggering protein complexes that, in turn, regulate cell death (18, 19). By contrast, TNF-related apoptosis-inducing ligand (TRAIL) inhibits T lymphocyte activation by blocking cell cycle progression (20) However, neither Fas ligand, lymphotoxin-β (a member of TNF family), or TRAIL was expressed by the MSC-2 line (Fig. 6⇓). Although some basal transcription of TNF-α occurred, this was down-modulated by IL-4. In contrast, Fas, TNFR, and CD30 (Fig. 2⇑B), another member of the TNFR family, are present in IL-4-treated MSC-2. IL-4 therefore appears to make MSC-2 more susceptible to death signals. However, the death domain-containing proteins (TNFR-associated death domain protein, Fas-associated death domain protein, and receptor interacting protein) that convey the death signal from the membrane-associated receptors are apparently down-modulated by IL-4 (Fig. 6⇓A). TGF-β, a cytokine with several inhibitory functions (21), did not seem to be responsible for T lymphocyte suppression because it was expressed equally in suppressive and nonsuppressive lines (Fig. 6⇓); moreover, a mAb neutralizing the biological activities of TGF-β1, 2, or 3 did not reverse the suppression of T lymphocyte activation mediated by MSC lines (data not shown). Profile of apoptosis-inducing molecules and ligands following MSC-2 exposure to IL-4. MSC-2 were cultured in the absence (1 ) or presence (2 ) of 100 ng/ml IL-4 for 2 days. J774A.1 was used as control. A quantity amounting to 5 μg of total cellular RNA was hybridized to the PharMingen mAPO-3 (A) or mCK-3b (B) riboprobe for 20 h at 56°C, as described in Materials and Methods. Following gel electrophoresis, the gel was exposed to Kodak Biomax MS x-ray film for 24 h at −70°C. L32 represents a control ribosomal gene. Lane 1, J774A.1 RNA; lane 2, MSC-2 RNA; lane 3, MSC-2 RNA following treatment with IL-4. RNA was extracted from one experiment representative of three different experiments that gave identical results. Inhibition of T lymphocyte activation by suppressor cells found in primary and secondary lymphoid organs as well as in peripheral tissues has been documented in normal and pathological situations, such as tumor growth, overwhelming infections with microbes, parasites and protozoa, immunization with powerful recombinant vaccines, treatment with cyclophosphamide, following total lymphoid irradiation, during graft-vs-host disease, in pregnancy, and in normal adult bone marrow or fetal and newborn tissues (1, 2, 4, 5, 22, 23, 24). We and others have shown that suppressor cells can be identified as CD11b+/Gr-1+/CD31+ immature myeloid cells that inhibit T lymphocyte functions in seemingly unrelated conditions that all lead to immunosuppression in mice (1, 2, 5, 25). To investigate the common immunosuppressive mechanisms, we have generated, by means of retrovirus-mediated immortalization, two myeloid lines that provide a continuous source of homogeneous suppressor cells. These lines were apparently arrested at various stages of the monocyte-macrophage differentiation pathway, but they clearly differ from classic macrophage lines such as J774A.1 and MHS (not shown), which are, in most experiments, nonsuppressive. The reasons for the preferential recover of monocyte-related suppressors following the immortalization process might depend on the ability of the oncogenes encoded by the immortalizing retrovirus to preferentially support the proliferation of monocytic rather than myelocytic elements. Although the MSC lines are negative for the Gr-1 myelocytic marker, they are most likely a reliable counterpart of fresh MSC, because CD11b+/Gr-1+ cells from the spleens of immunocompromised mice rapidly lose Gr-1 following in vitro culture (2, 3), suggesting that fresh MSC are already committed toward the monocytic lineage. The differences found among the MSC lines probably reflect a heterogeneity in the Gr-1+/CD11b+ progenitors. Phenotypic and functional analyses indicate that at least two different myeloid stages can be distinguished for the suppressor cells. MSC-1 is the prototype of immature monocytic suppressor cells that does not require preactivation with cytokines to exert an inhibitory activity on T lymphocytes, while MSC-2 is a more mature cell that requires IL-4 pretreatment. It was recently shown that IL-4 causes alternative activation of macrophages (28). Alternatively activated macrophages can be distinguished, phenotypically, by the expression of a distinctive set of molecules including antiinflammatory cytokines such as IL-1R antagonist and receptors used in innate immunity. Functionally, they can induce tolerance and down-regulate inflammatory responses (28). In one report, IL-4-stimulated human macrophages inhibited mitogen-mediated proliferation of CD4+ lymphocytes by an as yet unknown mechanism (29). Our experiments suggest a relationship between our myeloid suppressors and the alternatively activated macrophages, particularly in the case of MSC-2, which not only gains the suppressive phenotype in response to IL-4 (Figs. 1⇑, 3⇑, and 5⇑), but also up-regulates the expression of IL-1R antagonist (not shown). An increase in the proinflammatory cytokine, IL-6, following IL-4 treatment (Fig. 6⇑), however, implies a more complex pattern of IL-4 activity on the MSC-2 line. IL-4 exerts an important role in the control of immune responses in vivo. When transgenically expressed in the pancreatic β-cells of nonobese diabetic mice or in the CNS of SJL/J mice, IL-4 prevented autoimmune diabetes and experimental allergic encephalomyelitis development, respectively (30, 31). APC alternatively activated by IL-4 might thus play a role in controlling the response of T lymphocytes to Ags presented by peripheral tissues. It has been shown that peripheral tolerance to MHC class I-restricted self Ags occurred by two simultaneous processes: apoptotic elimination of self-reactive CD8+ T lymphocytes, and clonal anergy associated with down-regulation of the αβ TCR and CD8 (32, 33). Interestingly, in our studies, both events, i.e., apoptosis and down-regulation of the CD8 molecule, were observed in vitro when cloned CTL were activated by the Ag in the presence of MSC lines (Fig. 5⇑). However, the MSC lines express very few MHC class II molecules, and therefore most certainly lack the capacity to present self or allo Ags to CD4+ T cells. Moreover, they inhibit proliferative responses of both CD4+ and CD8+ T cells indiscriminately, regardless of whether Ag or mitogen is used in stimulation (data not shown). It is therefore unlikely that the normal counterparts of the MSC lines interact with T cells in an Ag-specific manner, but instead, they most probably serve as homeostatic regulators that temper responses of all T cells during periods of intense, sustained antigenic challenge. We thank Pierantonio Gallo for assistance with graphics, Vito Barbieri for the technical assistance in mouse studies, and Della Reynolds and Stephanie Ellis for help with the gel electrophoresis. ↵1 This work was supported, in part, by the Italian Association for Cancer Research and by the Istituto Superiore Sanità, Italy-U.S. cooperation program for the therapy of cancer, Grant 981. E.A. is supported by a fellowship of the Italian Foundation for Cancer Research. ↵3 A. Mazzoni, V. Bronte, E. Apolloni, P. Serafini, P. Zanovello, A. Visintin, J. H. Spitzer, J. A. Titus, and D. M. Segal. Myeloid suppressor lines inhibit T cell responses by NO dependent and independent mechanisms. Submitted for publication. 4 Abbreviations used in this paper: MSC, myeloid suppressor cell; DC, dendritic cell; TRAIL, TNF-related apoptosis-inducing ligand. Bronte, V., E. Apolloni, A. Cabrelle, R. Ronca, P. Serafini, P. Zamboni, N. P. Restifo, and P. Zanovello. 2000. Identification of a common myeloid progenitor capable of activating or suppressing CD8+ T cells. Blood. In press.